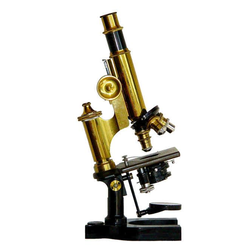 Creating a niche of Compound Microscopes such as Binocular Research Light Compound Microscopes, Binocular Research Microscopes, Wide Field Student Microscopes, Pathological Microscopes and Senior Student Microscopes at its best, with utmost quality. Reflecting Innovations in Optical design, Mechanical engineering & Illumination concepts, the PRIMA delivers evolved performance features to a growing list of happy users.We are leading of Binocular Research Microscopes which is also known as Binocular microscope, Research Microscope and Biological Microscopes. Latest design for both Classroom & Laboratory environment. Stand : Stable & sturdy C shaped stand with well-contoured modular base, corrosion resistant paint and heat resistant pads. Viewing Head : Binocular tube, inclined at 45° rotatable through 360° with IPD 55-75 mm and Dioptric adjustment. Anti fungus treated. Stage : Double layer graduated mechanical rectangular stage size 142 x 133 mm cross travel 75 (X) x 50 (Y) mm on ball bearing co-axial controls spring clip specimen holder. Focusing Module : Ergonomic low position co-axial coarse and fine focusing system on ball bearing guideways. Tension adjustment ring and Auto Focus provided. Packaging : The microscope is packed in STYROFOAM box with dust cover and other accessories. Warranty: 1 year electronics, 2 years optics. A monocular body with horse shoe shaped base hinged type, versatile designed inclinable to 90o assembled from DIE-CAST parts. Rack and pinion knob provided for sensitive focusing. Separate coarse and fine motion knobs with very precise & accurate graduated fine motion reading to 0.002 mm, for fine adjustment and a stopper to prevent damage to glass micro slides and objective lenses. Triple revolving nose piece with positive centering and click stop. Two lens abbe condenser N.A. 1.25 with continuously variable iris diaphragm and swing out filter holder. Standard plano concave mirror 50 mm dia. in fork for natural light, replaceable by a substage microscope lamp. Black stoving finish and hard instrumental chromium plating will accent any classroom environment. A monocularbody with horse shoe shaped base hinged type, versatile designed inclinable to 90o assembled from die-cast parts. Rack and pinionknob provided for sensitive focusing. Separatecoarse and fine motion knobs, with very precise and accurate graduated fine motion reading to 0. 002 mm, for fine adjustment and a stopper to prevent damage to glass microslides and objective lenses. Triplerevolving nosepiece with positive centering and click stop. Black stoving finish and hard instrumental chromium plating. Packaging Details: these microscopes are packed in shockproof Styrofoam moulded box or in a plywood cabinet having provision for placing eyepieces and objectives and dust cover. Monocular body with horseshoe shaped base hinged type, versatile designed inclinable through 90-degree Aluminium Die-Cast parts. Triple or quadruple revolving nosepiece with positive centering and click stop. Coarse motion through rack and pinion. Very precise and accurate graduated fine motion reading to 0.002 mm. Safety stopper prevents damage to slide and objectives. Packaging Details: These microscopes are packed in shockproof STYROFOAM molded box having provision for placing eyepieces and objectives and dust cover. Plywood cabinet extra. Nosepiece Quadruple Ball Bearing Revolving Nose Piece With Positive Click Stop & Rubber Grip. MONOCULAR head inclined at 45 degree and rotatable in 360 degree fitted with highest quality prism to ensure highly accurate collimation for stain free observation. SEPARATE coarse and highly sensitive graduated fine focusing knobs reading up to 0.002 mm and Slide Safety topper. Substage condenser NA 1.25 fitted with iris diaphragm and swing out filter holder with blue filter moving up and down through rack and pinion mechanism. Nylon Dust cover. Detachable power cord and 3-pin plug. Objectives HD DIN infinity PLAN Achromatic, Anti fungus Treated 4x,10x, 40x, 100x. 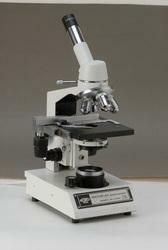 Packaging : This microscope is packed in STYROFOAM box with dust cover and other accessories. Warranty: 1 year parts, 2 years optics. Optional Accessories: Fluorescence Attachment, Polarising Attachment, Dark field attachment, Phase contrast attachment. Focusing :Co-axial fine & coarse focusing control with ball bearing guideways based on four stage gear reduction system, free from any back lash & large knobs provide a soft & sophisticated touch to the microscope. Packaging contents :Packed in shockproof Styrofoam molded box or in a plywood cabinet having provision for placing eyepieces, objectives. Nylon Dust cover. Detachable power cord and 3-pin plug. Accessories (optional) :Dark field and phase contrast kits. Objectives HD Eco Infinity Plan Achromatic, Anti Fungus Treated 4x,10x, 40x, 100x. 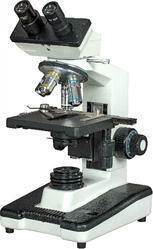 We have carved out a position in manufacturing, exporting and supplying the best qualityMonocular Coaxial Microscope. 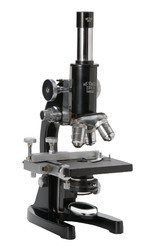 The offered coaxial microscope is precisely developed under the direction of our professionals using advance technology keeping in mind the all standards of industry. 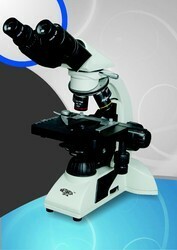 Our coaxial microscope is ideally recommended for routine as well as research work. 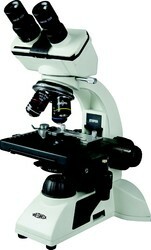 This coaxial microscope incorporates all the features of international microscopes for professionals. MONOCULAR head inclined at 45o and rotatable in 360o lockable at any angle. Both eyepiece tubes focusable to match objectives tube length. Stand : Stable & sturdy C shaped stand with well-contoured modular base, corrosion resistant paint and heat resistant pads. Extended base for better stability. Camera and LCD display: 8 inch LCD screen. Built-in integrated 5MP digital camera with Ethernet/HDMI/ USB & Ipiad connections output with 5MP Resolution. Internal media card reader/writer. Nosepiece :Low friction & fully parafocal Reverse angle quadruple Revolving nosepiece (Ball bearing type) with click stop & rubber grip. Focjusing : Ergonomic low position co-axial coarse and fine focusing system on ball bearing guideways. Tension MODULE adjustment ring provided. Fine Graduation 2-3 micron. Stage : Ceramic coated rackless Double layer graduated mechanical rectangular stage size 140 x 132mm wire cross travel 75 (X) x 50 (Y) mm on ball bearing co-axial controls spring clip specimen holder. Packaging Contents :The microscope is packed inside a STYROFOAM box with Dust Cover. Standard Accessories: Styrofoam molded box, dust cover, instruction manual, fuse. Stage :Rectangular mechanical stage with anti corrosive coating (long life), Scratch proof stage with a travelling range of at-least 70mm(X) 50mm(Y) 38 with two slide holder. The X-Y control on right hand side and specimen holder with spring clips on the left side protective mechanisms for smooth operation. Refocusing Mechanisms or equivalent to reduce mechanical depreciation. Illumination :High illumination white light LED illumination with 60,000 hrs. Lamp life having fly eye optics or similar for Eco-uniform illumination for Bright filed, Phase contrast, simple polarizing observation. Up gradation System upgradeable in Fluorescence (130W mercury/LED), Phase contrast, Dark-field, Polarizing technique, teaching heads, Drawing tube as required. We are instrumental in providing our clients a comprehensive range of Brass Dissecting Microscopes that is for demonstration of botanical specimens & insects at elementary school level. This dissecting microscope is developed by our highly experienced professionals using latest technology & top quality of electrical components. 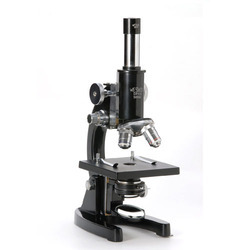 Having a stable round base, this dissecting microscope is equipped with a joint revolving arm for moving the magnifying lens over full range of the stage. Portable Dissecting microscopes (Round Base) instrument for demonstration of botanical specimens & insects at elementary school level. 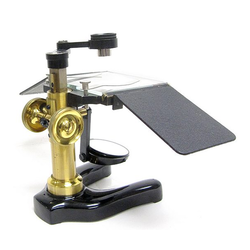 Having a stable round base, this dissecting microscope is equipped with a joint revolving arm for moving the magnifying lens over full range of the stage. The stage of this dissecting microscope is provided with spring stage clips has an easily removable thick glass plate with arrangement for inserting white or black plate respective background. Metallic hand rests are provided for easy working and the reflection from a plano-concave mirror in fork. 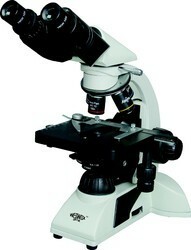 This dissecting microscope can be focused by a smooth rack & pinion. A Superior and most advanced microscope for the use in research and pathological Laboratories and clinical centers. Supplied with : WESWOX optics. ü Monocular body with horse shoe shaped base hinged type, versatile designed inclinable through 90o Aluminium Die-Cast parts. ü Mechanical tube length 160 + 1 mm. ü Triple revolving nosepiece with positive centring and click stop. ü Coarse motion through rack and pinion. Very precise and accurate graduated fine motion reading to .002 mm. ü Fixed square stage120mm x120mm fitted with detachable graduated mechanical stage for X and Y movement upto 40mm to 75mm. ü Two lens Abbe condenserNA 1.25with iris diaphragm and swing out filter holder with blue filter, moveable through rack and pinion. ü A standard plano-concave mirror 50mm dia. in fork, replaceable by a substage microscope lamp. ü Safety stopper, prevents damage to slide and objectives. ü Black stoving finish and hard instrumental chromium finish. ü Complete with optics, these microscopes are packed in shockproof Styrofoam molded box having provision for placing eyepieces, objectives and dust cover. Eyepieces : WF 10x & H15x.